For purposes of a more professional approach and wider opportunities for commerce in the practice of arts in Nigeria, the Modern Day School of Art has packaged a new creative learning curriculum as a finishing touch in the study of arts. 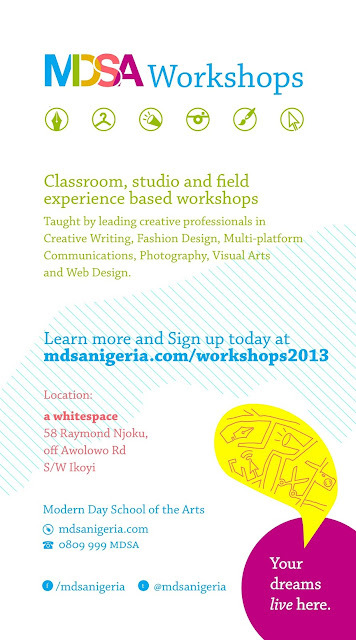 Adenrele Sonariwo, one of the lead team members, said that the school’s programme is billed to take off on January 7, at the Whitespace, Ikoyi, Lagos, with weekly practical classes in six core areas of Creative Writing; Fashion and Designs; Photography; Web Design and development; Visual Arts, and Multi-platform Communication. Building its strategy with resources from within the sector, renowned artists like Don Berber, Ituen Bassey, Tolu Ogunlesi, Victor Ehikhamenor, Omoyemi Akerele, and Mudi Yahaya would among many others, be taking the students in the diverse areas of the arts.